The 'Scottish Highlands and Islands' Tour is the number one tour destination and fabulous! Visiting Scotland, with her beautiful verdant green landscapes, the lowlands and highlands, ancient castles and monuments, and culture abounds. You'll discover the history, and Scotland's wonderful people, their exciting lifestyle, tales, kilts, plaids, and fearsome warriors! Book Early for 2012 and Save from 5% to 10%, depending how far out you book your tour. More Savings are available when combining two of our Coach Tours and Save10% per person on one land tour - the discount will apply to the tour of lesser value. We also offer our 55 & Smiling Discount if you are aged 55, saving you $55 per person on selected tours. Ask about applicable "55 and smiling" tours today! Our Tour Suppliers offer the largest selection of escorted coach tours around Scotland - dozens of itineraries of different lengths. Choose value-for-money first class hotels or splurge with deluxe properties. All our Scotland coach tours feature most meals, including specialty dinners with lively, traditional Scottish entertainment. All daily sightseeing is prepaid and included on all our Scotland tours. Prices are noted with or without airfares. Our inclusive TOURS are noted with an * and all other tours and meals are noted expressly in the itinerary that we'll send you. After getting settled into your hotel in Glasgow, you'll discover the main attractions of Glasgow as you drive around George Square with its ornate City Chambers and nearby Glasgow Cathedral. Your tour will take you to Loch Lomond, and Glen Coe and the notorious Campbell massacre of the Clan Macdonald in 1692, and on to Ft Williams stopping at Ft Augustus you'll take a cruise on the infamous Loch Ness and perhaps you'll see 'Nessie'? Continuing on to Nairn where your hotel was a favorite summer residence of Charlie Chaplin. A visit to the Culloden Visitor Centre where you'll learn about the Battle of Culloden where Bonnie Prince Charlie was defeated by the British army in 1746, changing the traditional way of Highland clan life forever. Drive through the Grampian Mountains to visit Blair Athol Distillery in Pitlochry and see how whisky is distilled and sample some. 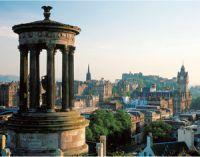 Next is Edinburgh where a city guide will point out the principal sights as you drive along the bustling Princes Street and through the wide streets of the 200-year-old Georgian New Town, as well as the medieval section along the Royal Mile where some houses reach 11 floors tall. Visit Edinburgh Castle, which dominates the city and contains the Scottish Crown Jewels and the Stone of Scone. Our most popular Britain vacation offers you the best of this great land. Guided sightseeing shows you all the famous landmarks in London: Parliament, Big Ben, Westminster Abbey, Buckingham Palace, and visits to St. Paul’s Cathedral and the Changing of the Guard, if held. Head southwest to admire the breathtaking gardens at Henry VIII’s Hampton Court Palace, then venture on to prehistoric Stonehenge, the Roman excavations of Bath, the Cotswolds village of Stow, Shakespeare’s birthplace in Stratford-upon-Avon, and picturesque Llangollen in North Wales. Travel north through the Lake District, pausing in Wordsworth’s Grasmere and Gretna Green before arriving in Edinburgh, Scotland’s capital. Admire the Crown Jewels at Edinburgh Castle and Holyrood Palace. In medieval York, enjoy a walking tour that features York Minster and the narrow Shambles. Return to London by way of the market town of Stamford and the university city of Cambridge. of Inverness. Travel south, stopping to visit a whisky distillery and Balmoral Castle (when open). Spend two nights in Edinburgh and visit the famous castle and Holyrood Palace. In the Lowland hills, see the blacksmith’s shop at Gretna Green before crossing into England. Delight in the beauty of the Lake District on your way to Grasmere. Explore the North Wales towns of Betws-y-Coed and Caernarvon, then ferry across the Irish Sea to the “Fair City” of Dublin, where an orientation drive shows off O’Connell Street, St. Patrick’s Cathedral, and Trinity College. Visit the Irish National Stud at Kildare. Stop in Blarney and at the popular resort of Killarney. Marvel at the scenic Ring of Kerry, the spectacular Cliffs of Moher, and stunning Giant’s Causeway. Visits to the pilgrimage village of Knock, world-famous Belleek Pottery, Derry, and Belfast are also included, before returning to Glasgow for the conclusion of the tour. Travel: Glasgow / Glasgow - Overnights: 2 Glasgow, 1 Inverness, 2 Edinburgh, 1 Liverpool, 2 Dublin, 1 Killarney, 1 Limerick,1 Sligo, 1 Belfast - Meals: Full English Breakfast daily, 7 three-course meals. The haunting skirt of the bagpipes during a private evening in Inverness, treasured family tartans,wee drams of single malt whiskies on a private distillery tour... a cocktail cruise on fabled Loch Lomond... the strong traditions of the Clans... fascinating history at Stirling, Edinburgh, Cawdor (the legendary home of Macbeth) and Blair castles... incredible scenery in the Highlands and along brooding Loch Ness... Palace of Holy Roodhouse (the Queen’s residence) and the Royal Mile of pubs, shops, and historical sites... a uniquely vibrant culture lovingly preserved in the capital of Edinburgh..
Distillary, the Royal Deeside and afternoon tea, with a stop in Braemer, and a stop at the Falls of Feugh near the village of Banchory, other visits to Glamis Castle the legendary setting for Macbeth, and on into St Andrews - the home of golf! Last but not least is Edinburgh Castle and City tour and much more, call us for a detailed itinerary. 9 DAYS LAND from $1684 and w/AIR from $2314: Travel to Glasgow / Edinburgh Overnights: 1 Glasgow, 1 Ballachulish, 1 Nairn, 2 Blairs, 2 Edinburgh [ the 9 Days is 3 nights Edinburgh ] from $1684 per person. Visits and admissions to Glasgow Cathedral, Ben Nevis Highland Centre, Dunvegan Castle, Inverewe Gardens, Skara Brae, Ring of Brodgar, St. Magnus Cathedral, Italian Chapel, Dunrobin Castle, Urquhart Castle, Culloden Battlefield, Fort George and Edinburgh Castle are all included. Titanic Belfast, the Cliffs of Moher and Kilronan Castle Stay. From Edinburgh to Shannon, your first day is at your leisure to use the hotel facilities, play some golf or just rest from your travel over. That night you'll visit a Scottish Cabaret. Other highlights of this trip are Edinburgh Castle & City Tour, Sheepdog Trials & Culloden, Isle of Skye & Clan Donald Centre, Rabbie Burns & Belfast, the Titanic Belfast Tour & Mount Stewart, the remarkable Giant's Causeway, Derry's Walls & Donegal and on to visit Glenveagh Castle & Donegal, and then a visit to Belleek China and a Kilronan Castle Stay! Continuing on to Strokestown Park House House in County Roscommon. There are three parts to see - the 18th century mansion with its original furnishings; the four-acre walled garden, restored to look as it would have during the heyday of the estate; and the Famine Museum, which explains the circumstances of the 1840's Great Irish Famine through a combination of original documents and images. Travel south passing the city of Galway to view and the fabulous Cliffs of Moher,and a fabulous evening is planned at Bunratty Castle - a medieval style banquet awaits you in a real medieval castle! This is our most comprehensive Scotland vacation! After an overnight in Glasgow, head south to the Lowlands to see poet Robert Burns’ birthplace in Alloway and Gretna Green. Cross into England for a guided visit of 11th-century Carlisle Castle and to see a section of Hadrian’s Wall. Back in Scotland, see the house of Mary, Queen of Scots, the Jedburgh Abbey ruins, Floors Castle, and spend two nights in the Scottish capital of Edinburgh, with visits to its castle and Holyrood Palace. Heading north, stop at St. Andrews, home of golf, and Braemar, home of the Royal Highland Games. In the Scottish Highlands, drive through the Grampian Mountains, visit a whisky distillery, and the Highland capital of Inverness. An included excursion takes in Cawdor Castle, setting for Shakespeare’s Macbeth. Also visit majestic Dunrobin Castle before boarding a ferry for the Orkney Islands. Here, a Local Guide shows you the unique sites, including a 5,000-year-old Neolithic village and the Ring of Brodgar, the area’s own Stonehenge. Stunning scenery delivers you to the isles of Skye and Mull for 2-night stays on each. Return to Glasgow for the completion of your vacation. 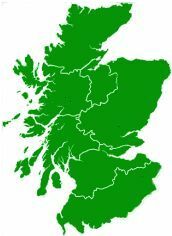 Travel: Glasgow / Glasgow - Overnights: 2 Glasgow, 1 Carlisle, 2 Edinburgh, 1 Inverness, 2 Thurso, 2 Isle of Skye, 2 Isles of Mull | Meals: Full English Breakfast daily, 10 three-course meals w/choice of menus, includes a welcome / farewell dinner. We'll email you and call you back within 24 hours after receiving your request. Rest assured that we'll do our best to make your Scottish Travel Experience a great one! Please fill in all the requested info, as it is necessary to help you with travel inquiry, and please check your SPAM and JUNK folders for a reply from French at a Touch travel services. Thank you for visiting French at a Touch, and have a great day!